Our plans for rainwater catchment systems range from basic CAD stock plans to guide your own installation to fully customized systems for industry professionals and permits. This service provides you a range of options. The simplest is just a Sample CAD Rainwater Harvesting Drawing, a stock plan, to give you an idea of what a system looks like and should inlcude. Or you can have a system designed specifically for your requirements. Basic Rainwater Catchment Plan $350 - This is a set of 2-D CAD construction documents for a non-potable water system that is sized for the climate and exact location of your house and common irrigation needs. Includes the plumbing and layout PLAN and our tips and techniques for installation all based on current national plumbing codes. (The Basic plan is suitable for simple rainwater harvesting projects. It is intended for plumbing professionals or experienced owner-builders who need little to no guidance and know the local building and plumbing codes). 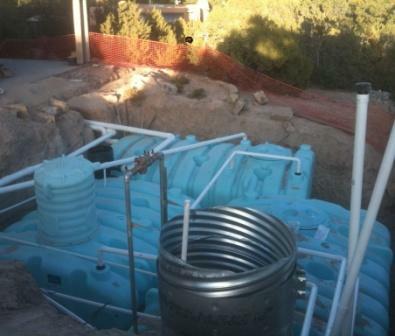 Custom Rainwater Catchment Plans – starting at $750 - Priced according to project scope. This set of CAD documents is customized to your site, climate and irrigation plans. This includes the Basic PLUS Plan with additional elevation drawings and cross sections of the system which is tailored to your custom project. Consulting hours are billed at $85 per hour. Custom projects can include rainwater harvesting, greywater recycling and blackwater treatment depending on your local jurisdictions. Custom plans can integrate greenhouses, complex landscaping designs and natural swimming ponds. (Custom Plans are suitable for complex and large volume harvesting plans and require a licensed professional to install). Plans are drawn by Kari Bremer who is a sustainable designer of natural homes and green building projects. Kari has been in the sustainable building industry for 17 years and has spend 12 years as an architectural designer / project manager. She offers architectural design and consulting services for residential projects, as well as supplying 2-D construction documents and 3-D renderings for building professionals. Her repertoire also includes green remodels, custom mountain homes, farms and ranches. Kari can be reached at www.naturalgreendesign.com. View a DRAFT design. This is a Sample and does not included the second page and is marked SAMPLE. The pictures above are from the project in the pictures above (i.e. a during installation photo and a completed photo). After choosing an option below and paying you will be sent either the Sample or a Questionnaire to Complete. Designs will typically take at least 10 business days to turn aroound.